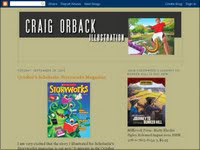 If you are in search of my latest news and more in depth information on my current projects I encourage you to visit my blog at craigorback.blogspot.com. Check it out and sign up as a follower! 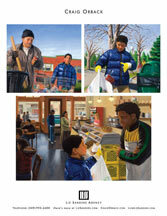 I am posting some PDF's if anyone is interested in purchasing any of my published children's books for the holidays. Also I have put together a pdf of original art for sale as well. 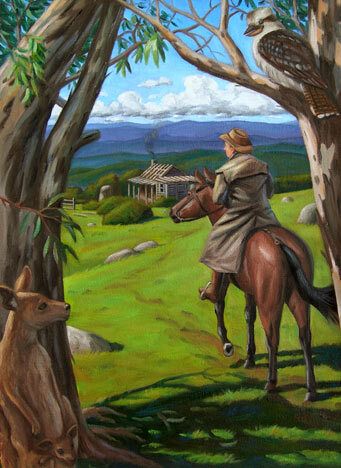 Landscapes, still lifes, and illustrations. Let me know if you have any questions! Earlier this year I finished work on the chapter book "Hot Pursuit: Murder in Mississippi" for Kar-Ben Publishing, due for release in spring 2010. It tells the true story of the murder of three civil rights workers in 1964, previously filmed in the movie "Mississippi Burning". It is both a moving and inspiring story because it focuses more on their good works rather than the tragic murders. To your left is the book jacket. I am now done with work on my first picture book for Lee and Low Books entitled "The Can Man", due for release in spring 2010. 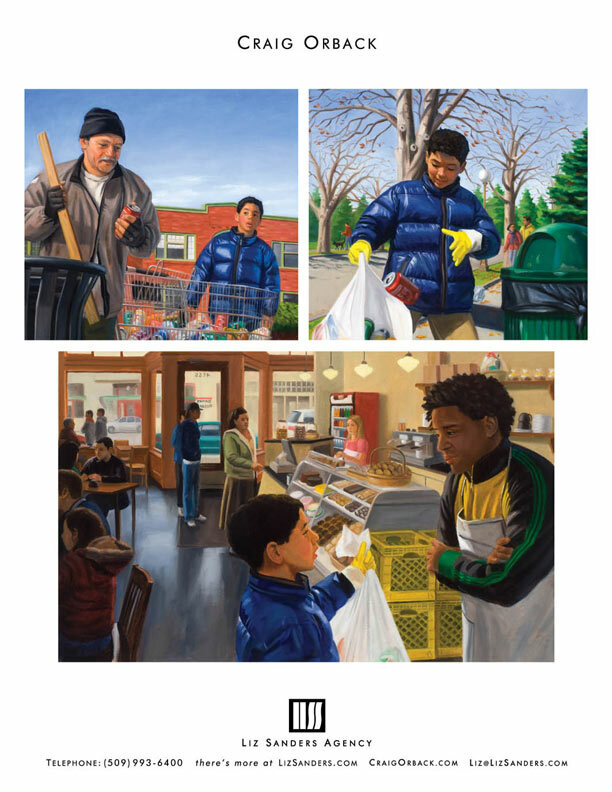 It's a wonderful fiction story about a young boy who wants a skateboard for his birthday but due to tough economic times has to earn the money himself by collecting cans in his neighborhood. The title refers to a local homeless man he meets along the way. I had so much fun working on this book! The project came about after meeting the editor in chief during my May 2008 trip to NYC to show my portfolio. To your left is some art from the book. 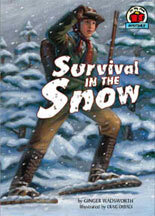 January 2009 saw the release of Survival in the Snow for Millbrook Press a nonfiction story set in California's Sierra Nevada Mountains in the winter of 1844/45. I have always been a fan of stories of survival in nature. It's a real page turner! 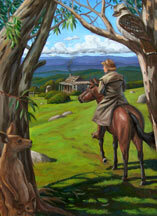 Art from the book is included in the books and portfolio sections. In May 2008 I visited New York City to show my portfolio and came away very inspired and hopeful. Thanks to all who made the time to review my work. I had 24 meetings with 57 people so as you can imagine it was a very full week! I received some great leads and advice. I learned MANY people would like to see more pen and ink work for possible chapter books so I have created two pages of new samples (my second new page is to your left). There is both a color and b&w version. I hope you enjoy them! Here is my first page of pen & ink samples I created right after my trip to NYC. Any feedback is always appreciated! To your left is some newer work created recently. 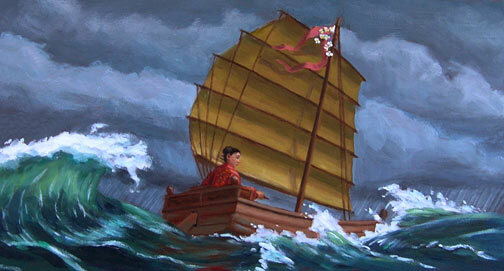 The boat scene was for a project in 2008. I reworked the image a bit to fit it in a more traditional rectangle format. The Australian scene was purely for fun. It was an image long lodged in my brain that finally saw the light of day. 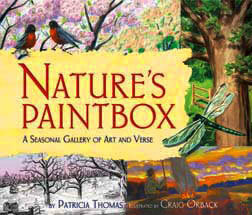 I am excited to announce that Nature's Paintbox A Seasonal Gallery of Art and Verse written by Patricia Thomas and published by Millbrook Press was released in late 2007. The original title was "Winter, I Think, Is Pen and Ink". It's a poem about the four seasons and I got to work in pen and ink, pastel, watercolor, oil paint, and the computer program Photoshop. A different art medium for each season. It was a dream job! 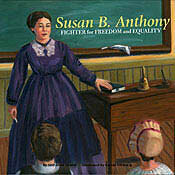 Susan B. Anthony Fighter for Freedom and Equality written by Suzanne Slade published by Picture Window Books is one of only 32 books to be selected for the 2008 Amelia Bloomer Project list of recommended feminist literature for young readers. The award is sponsored by the Feminist Task Force of the Social Responsibilities Round Table of the American Library Association.